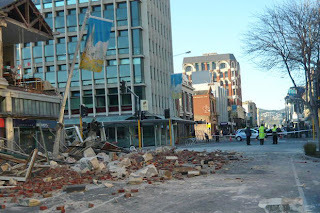 As you may or may not have heard we have had a bit of an exciting time recently in Christchurch. 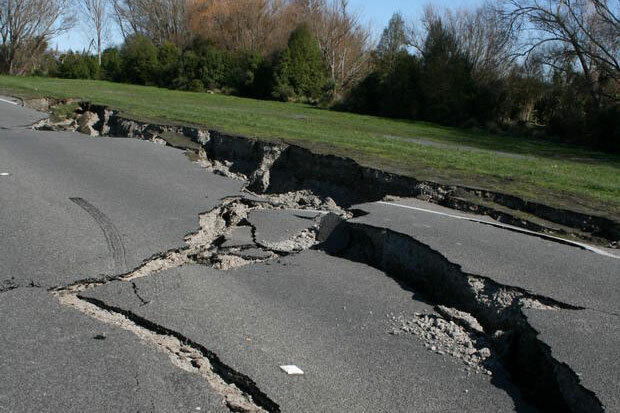 At 4.30am on Saturday morning we experienced a 7.1 magnitude earthquake. Yes, we are all ok and are very thankful for all the emails, phone calls, and texts that have come through to check on us. We were lucky. Some others were not so lucky. Thankfully there have been no fatalities though which is a blessing. 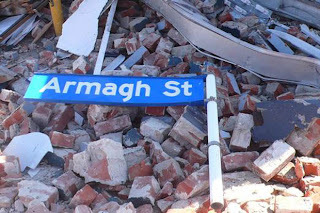 Had the earthquake hit a few hours earlier or later then the outcome may have been much worse. 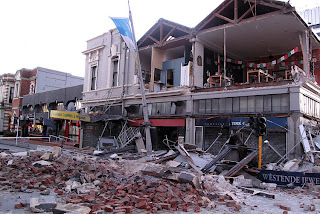 The centre of the city was badly hit and a lot of the older buildings did not make it. I was house/cat sitting for Claire at Roxburgh Street on Friday night while she was away for a surprise birthday night in Hanmer Springs with Scott. I was shaken awake and it took a few moments to realise what was going on. I got up and made it to the doorway, in the pitch black, while I could hear things falling throughout the house. It's all a bit of a blur now but it seemed to go on for ages. I do remember seeing the cats scamper past me and under the bed to safety. I briefly wondered if I should join them under there incase walls and ceilings started falling. And then the shaking stopped.... for a while. Luckily, because I have lived Roxy Inn, I knew where everything was so mananged to find Claire's torch WITH inbuilt radio. 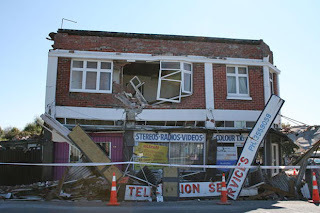 I lay in bed for the next 3 hours listening to talk back and texting people to make sure they were all ok.
Up in Hanmer Springs, 135km away, Claire and Scott were woken up by the room swaying. I text Claire to let her know that everything was alright as I didn't want her to turn on the television and see the news reports and worry. It didn't really work - she worried anyway. So at about 8am they left Hanmer Springs and headed home not really knowing what they were going to find, and foregoing the cooked breakfast that Claire had promised Scott and he was looking so forward to. Back in Christchurch we had no power and my cellphone battery had run out but the land line was still working. I was talking to Dad around 8am when a rather large aftershock shook the house. It only lasted a few seconds though this time. Phew, but it still made my heart rate go up. It was a relief to see Claire and Scott when they got home around 10am. Much nicer to have others around to share the doorways with. Toby stayed under the bed until midday whereas Min was outside patrolling the perimeter and scooting under the deck with every aftershock. The power came back on mid morning for us which was great. I was able to cook Claire's birthday dinner of beef olives, garlic bread, green beans, and mini roasties with gravy. I had made a chocolate cheesecake for dessert on Friday night - it was the first thing I checked on Saturday morning once it was light. It was still safely sitting on the top shelf in the fridge unscathed. The only breakages we had were one of Claire's beside lamps, a plate, and the spoon from the salt pig. Very, very lucky. I had also made a birthday cake on Friday night which turned out to be absolutely disgusting! I blame the earthquake. Scott seemed to like it though and took some for morning tea at work on Monday. He can stay. There were rumbles all throughout the weekend and everyone has been on edge since. No one seems to have slept much since Friday night as there are still a lot of aftershocks continuing - especially at night time. There was a quake just before 8am this morning measuring 5.4 and only 6km deep from over in Lyttleton - quite some distance from the original epicentre. It's scary. Everyone is over it and sleep deprived with shot nerves. I took today off work as a 'sick day' to try and catch up with myself. I can't concentrate on much at work and feel so, so tired. All schools and daycare centres in the Christchurch area are closed until Monday although Claire is going back to work tomorrow to catch up with the other teachers and make sure her nursery is ready for when the children come back. I think it helps to talk to others and discuss emotions. It has really affected the region. Other, equally dramatic (on a different level) news is that I quit my second job at Cherry Tree a few weeks ago. I had a run in with the call centre supervisor after pulling her up on some lies that I had heard she had said which she denied. After a heated discussion I sat back at my desk, text Claire to tell her I was coming by after work, and then thought 'Actually, I don't need this' so got up and left in a blaze of glory. I got to Claire's and rang my manager to tell her I had just walked out and would not be back. I have never ever walked out of a job before and it felt very liberating to take control and not put up with their crap. The following day my boss rang me and asked me to reconsider as she didn't want to lose me. Which loosely translates to 'I have no staff because they keep leaving because I'm a bully, please come back to keep the calling numbers up and make me look good.' I said no. She asked me to think about it and give her a call on Monday. I still said no. It is SO nice having my evenings back. You would THINK that I would have had more time to do important things like update the Roxy Review, wouldn't you? I don't really know what I have been doing but my nights are full. Must try to prioritise. We celebrated Alex's 20th birthday on Monday by going to Paula and Kazio's for dinner. It was nice. Alex's girlfriend Sam was there as was his friend Jesse. Scott came too and it was a lovely dinner and a very pleasant evening. Alex had told Paula he didn't want us to sing Happy Birthday to him which of course meant 'please sing Happy Birthday as loud as you possibly can to me'. He was suitably embarrassed. My work there was done. Toby has had a very stressful week. After being part of a massive catfight in the driveway on Friday night he came running inside with his tail the size of a racoon's. Then of course there was the trauma of the earthquake. He jumped everytime there was an aftershock and was not his usual staunch self. Everytime we went outside on Saturday he would come out and run to the garden to wee but nothing was happening. Claire and Scott took him to the emergency vet on Sunday morning and they put in a catheter to drain his bladder. They kept him in overnight and then on Monday Claire had to pick him up before 8am and take him to his usual vet so they could carry on his treatment. He stayed with them for two more nights while they monitored his peeing pattern. We went in today to pick him up and he was very relaxed and looking a lot happier. The nurse told Claire that this morning she heard him meowing loudly so went down to see that he was alright and then the earth shook. Like he was yelling at her to come down to where it was safe. He's home now and is to be kept in for a few days. He is currently lying, stretched out in front of the heater. Hopefully he is all fine now and will eat and wee regularly. Poor little man. And we have another new follower to the elite club - welcome Kathryn!